The Decision To Cut My Hair! Ivonne holding her brades after new haircut. The decision to cut my hair was not a difficult one to make. I knew that I would eventually cut it, the question was “when”. 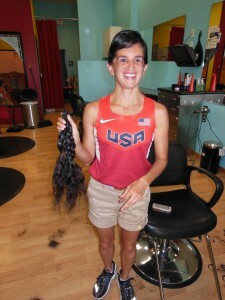 At first, there was a bit of anger and sadness as I thought about cutting my long dark black hair. Sadness because of the realization that no matter how well I took care of my nutrition, my sleep, exercise, and emotions, my hair would still fall out. This is just one of the side effects of Chemotherapy. Sadness because I have dreamt of racing at the 2016 Paralympics with a long brade down my back. Now I’ll have less than two years to grow it back! The anger came as a natural emotion of coping with cancer; why me, why now, how will I handle questions about what happened to my hair? Then, as the tears streamed down my cheeks and fell onto my pillow, I reminded myself that there was no sense in me asking “why?” The key to moving forward, past the anger and sadness, would be to decide what to do about my hair. That’s when I told myself, “Ivonne, you can donate your hair and bring another human being joy!” It was then that I decided to donate my hair to Locks of Love, a public non-profit organization that provides hairpieces to financially disadvantaged children in the United States and Canada under age 21 suffering from long-term medical hair loss from any diagnosis. I chose Locks of Love because I believe that it is essential for children to feel empowered and self-confident to face their peers and the world starting at an early age in life. Our experiences and feelings from childhood play a crucial part in life as we become adults. This thought brought me piece with the decision to cut my hair immediately in order to donate as much of it as possible. I found a salon called Pigtails and Crew Cuts in Chula Vista California that gave me a free haircut because I would be donating my hair to Locks of Love. My hair was braded into 6 brades, which were cut and neatly placed into a plastic bag and padded envelope to be mailed off to Locks of Love. My hair was then trimmed up nicely and evenly, and it was short but cute! Thank you to the warm and welcoming staff at the salon! I even had a support crew come to the salon with me: John (husband), Sandra (oldest sister), Ariana (Niece), and William Adrian (nephew)! We all Facetimed with my mom as well! Everyone’s support made the experience light and fun! I can’t thank my family enough for joining me today!